How far would you go for your friends – and what if you suspected everything they’d ever told you was a lie? Hugh Whitemore’s 1983 drama, adapted from his earlier TV play, pits patriotism and a deeply ingrained sense of duty against personal loyalties, when a suburban family become an unlikely weapon in the war against Soviet espionage. The banality of the setting and horrible absurdity of the situation – which is based on the historical Portland Spy Ring case – chimes with the recent Salisbury poisonings. Finty Williams and Chris Larkin are Barbara and Bob Jackson, “the kind of people”, as Barbara ruefully puts it, “who stand in queues and don’t ask questions”. Tracy-Ann Oberman and Alasdair Harvey are their colourful Canadian neighbours; quiet, unassuming Barbara has an intimate friendship with Oberman’s blowsy Helen. A faintly Priestley-esque intervention by Jasper Britton’s Scotland Yard detective, who demands to use the Jackson house for surveillance, forces them into a queasy pantomime of pretence and double-bluff – even the unwitting Julie (Macy Nyman), the Jacksons’ sparky teenage daughter, who has secrets of her own. While the story is fascinating, the play itself is workmanlike, cluttered with lengthy explanatory monologues and leisurely in pace. 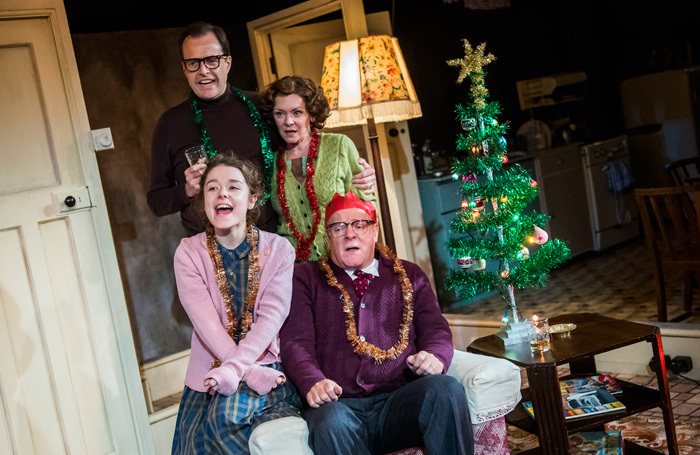 Hannah Chissick’s production, too, has an old-fashioned flavour, with Paul Farnsworth’s meticulously lifelike early 1960s set – all doilies, fringed lampshades and Formica. But that attention to detail also heightens the sense of dislocation in an ordinary English home where suddenly everything is in doubt. And the cast make the agony of deceit and betrayal feel movingly real.